One of the reasons why affiliate marketing has become so popular is that it’s a low risk but high potential business. Many new online entrepreneurs start their businesses off with affiliate programs. Affiliate programs are usually free to join. Marketing tools and ad copy come usually come with the package. The only expense you’ll incur is the cost of promotion. A perfect example for this is Moreniche,an affiliate program that caters to weight loss niche as well as the adult-related market. Another perfect example for online marketers who are in the make money online business is Clickbank, an affiliate program that offers money making products and guides to online job seekers. 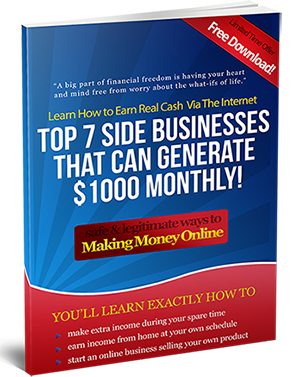 Some marketing gurus say you don’t need to have a website to earn money with affiliate marketing. While that is possible most successful marketers suggest that it will almost certainly be to your advantage in the long run to have your own site. Starting your own website will not really cost too much. There are cheaper but quality hosting sites like AnHosting where you can really host multiple domains. As for office expenses or employee overheads there is almost nothing to spend for. If you start with a simple website template you can actually do it yourself especially if you have a knowledge on HTML. There are lots of free tutorials about setting up your domain and hosting account, HTML coding, and managing your files if you search it on Google. You may not have to buy product, except for personal use. This saves you lot of money and also you will not have the risk of having to keep unsold inventory. Some self proclaimed marketing gurus advice that you should buy and try the product so you know exactly how to describe it to your customers. I think that depends on the product you have chosen to promote. You buy when you really need it. You don’t have to buy a lawn mower or a golf club just to try it. If you are a guy who promotes bra, because you think that is a profitable niche, then you don’t have to buy that bra to try it. That’s weird. With affiliate marketing there are no employees to pay or hassle with. The only time you will have to pay people to work for you is when you want to outsource or hire others for a project. If you want somebody to write for your content then you can do this fairly cheaply by hiring freelancers. One of the advantages of making money online with affiliate marketing is the fact that there is little or almost no customer service needed. Usually your merchant as the actual seller will be the one handling all this. We know that Affiliate marketing has a lot of potential but this will depend on exactly how hard you wish to work for your business. You will be seeing good returns on your advertising expenses provided you have done your research into each and every promotion you do. Tuesday I was searching for sites related to Marketing and specifically internet business promotion and I found your site. Great content. Looking for some marketing materials when I stumbled across your site. Your great blog is obviously worth a read if anyone comes across it. Im lucky i did because now Ive got an entire new view of that. I didnt realise the issue was so important thus universal. You definitely input it in perspective for all of us, thanks for the fantastic info. Some very good content here..will consume & practise. I myself trying out some affiliate marketing..Will bookmark..